A new version of ygopro has been released! New features include: server side software complete overhaul, bug fixes, new anime cards, win and loss music, delete deck button. As always the ygopro program should update automatically. Or download the manual update from the ygopro.co download page. I have another ideas. I hope you can add the option to have different background images for Menu, deck, and Duel field bg. Also it would be nice have a diferent Card cover for your opponent. The option of keep aspect ratio in configuration it would be great. Please excuse my bad english. Excelent job Percy!!! I found there's no respond when touching the "extra deck" zone in duel. Percy, Thanks for this update. What about create the anime card " card of the sanctuary" which allow both player to draw cards untill they have 6 in hand ? This must be the card most played in the first anime. can i suggest for a sealed pack play mode? It would be great to be able to search decks by typing in the lobby screen. Ok so that Percival18 doesn't have to answer two of these. 1st. You can change the background images for menu deck and duel field yourself by going into the file finding the current ones inputting your own one and renaming it to the original and deleting/removing the original. 2nd. There is no such card as card of the sanctuary. They use Card of sanctity. This is a non-anime card that allows you to remove all cards from play in your hand and your side of the filed to draw until you have 2 cards. Steeldarkeagel, the card i speak about, card of sanctity doesn't have the same effect in anime as in IRL. In IRL, the effect is as you say, but in Anime, the effect is to allow both player to draw cards untill they have 6 in hand without condition. And it would be great that Percu create this card with this effect. I think that with Pott of Greed, it must be the card that is the most used in Anime. It would be fine to have it in game. You mean a textfield for searching your own decks instead of a dropdown list? Yes sorry I forgot to add the picture. The picture is included if you download and apply the update again. Can u add Slifer from anime please ? Hey Percy, you can do the card "nightmare tri-mirror" and the card "cards of sanctity" with the effect of the anime? When the 'linux version' will be released? i agree with Francy, do you think you can create these cards please ? "Noble Knight Medraut" and "Artorigus, King of the Noble Knights"
Hey, i downloaded the game but each time i try to join a duel it just freezes there. I can't join nor host any duels because it freezes when i click "join" or "host". Anyone know a reason? Please, add ninja only anime cards. During the End Phase, if this card negated an effect this way during this turn: You can Special Summon this card from your Graveyard. You CANNOT special summon it by this effect if has been banished. Love the update Percy, the win/loss music and delete deck options are much appreciated, and the software seems way less buggy. My only disappointment is I was looking forward to some of the more recently-announced tachyon Galaxy (I want my Number 107! lol) cards and the TCG-Exclusives for Cosmo Blazer, but I can wait on those. Nice work. Thanks! The new cards will be added in February I think. 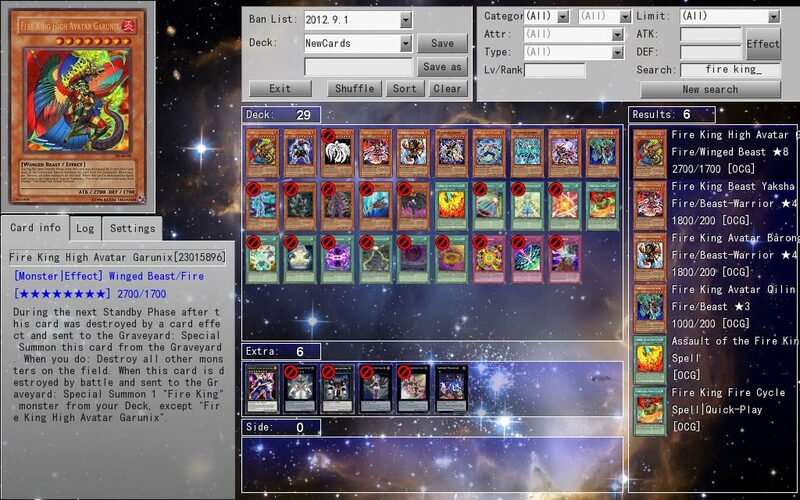 "Man u can please put Verz Ouroborus and Black COrn in TCG list. thx"
Why Two-head shark and Mermail Abbysmander are banned ?.They are not on 2012.09.01 ban list. Great update, thanks Soo much. if u have a monster with a special summon effect like junk synchron. if the enemy veilers the card, you cannot use duality in ygopro but shouldn't it be allowed since your special summon effect was negated? also, some 'this effect can only be used once per turn' cards do not follow that rule: i just played a game where i could use hysteric gift's end phase effect twice on ygopro. I believe the ZW Shield needs to be fixed. I still have problems with swap frog: i special summon it and then i return it to hand, but if i summon it once again (special or normal) it can't return to hand. Can i play with just 1 song, so with no advantage/disadvantage song? Btw thank u very much for the update! Wind-up arsenal zenmaioh effect must be fixed. there's a problem with the combo of black garden + phantom beast mega-raptor. when I summon a token on opponent's side of the field by black garden's effect, the effect of phantom beast mega-raptor active, but should not. Divine Judgement of Spellbooks is in this version? "Malice Ascendant" it effect not work..??? why?? You do have a Malice Ascendant on the field do you.. I have a problem with the update which it wont let me, heres what it said on the auto update, "some installation files are corrupt. Please download fresh copy and retry then installation. which I can't cuz I don't have an USB drive. and when I try to download the update by the old way its said, "C:\(user name)Downloads'\ygopro-102F.0v4-updateonly.7z The archive is either in unknown format or damaged"
the link update v3 to v4 is wrong. Please where can i download. Thanks. i cant see EXTRA DECK zone in duel (i can add cards in EDIT DECK) i cant add cards in the SIDE DECK!! v4 has some of file are corrupted error.